This illustration is a detailed image of the Kansas Portland Cement Company in Iola, Kansas. 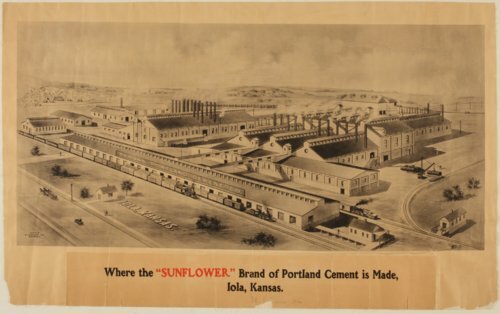 The caption at the bottom of the image is: Where the "Sunflower" Brand of Portland Cement is Made. This view shows how extensive the plant was. The lithograph was produced by Hurd Wheeler Company, Detriot, Michigan.